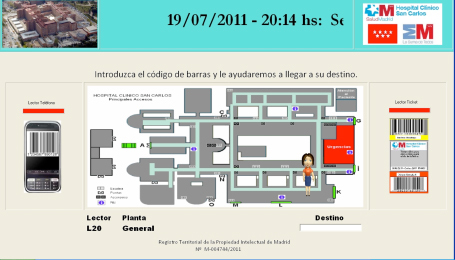 The Indoor Orientation System (IOS) is conceived for big surfaces, centers and buildings of public access, where the visitors frequently require indications and help to arrive to their destiny, still within a same building as it has been demonstrated the reduction in the capacity to retain several simultaneous indications. To help in an automated way to orient people, reducing the personnel intervention of the center and therefore, reducing costs. To offer a simple interphase so that any user can visually interpret the way he must follow to arrive at his destiny, to know beforehand the distance that must move and the time it´s takes. To consult repeatedly the code bar reading devices distributed in all the plants of the building and the system will recalculate the optimal way to arrive at destiny. To offer an alternative way, when the habitual way is inaccessible or when the destiny has changed of location. The SOI Internal Guidance System is designed for complex buildings, mall/shopping centers, fairs and exhibitions where visitors often require assistance to reach his destination. The Soiexp System is specifically bundle for stands in a fair and helps the visitor in searching for Companies, Products & Services, Exhibitor’s Services and parking car location. 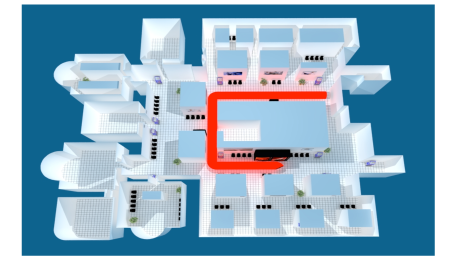 The Indoor-navigation concept is fairly widespread, but the functionality and method of resolution paths through an algorithm designed exclusively for this orienting system presents a simple and effective alternative to traditional visual information systems solution. It is important to note that it has been demonstrated the reduction in the ability of visitors to receive and hold multiple directions simultaneously, and the problem just increase if the user speaks another language. This is essential to a system of comprehensive and automated location. WEB: internet access on any device: Tablet PC, Smartphone with QR code reading. INTRANET: PC with touch screens connected to a LAN and / or WIFI access. Support automated people’s orientation, reducing involved center staff intervention and therefore reducing costs. Optimizes commuting time and distance and offers quick access to information. Prevents the proliferation of visual signaling, written and verbal instructions and excessive maps in the walls of difficult inquiry. It offers a simple interface for any user that can "visually" interpret the way to reach destination, knowing the distance to move along and in long distances, the approximate distance of the journey (transit through several buildings, hallways, etc.). When the user needs to visit several destinations (Multi-Destinations), the system plans the best way between them. Quick shortcuts to nearest location: WC, Cafeteria, output, public telephones, ATMs, etc. Repeatedly destinations consultation is allowed through touch screens strategically distributed in the fair or by scanning QR codes thru Smartphones. Once obtained the current position, the system SOIEXP recalculates the optimal path to reach the requested destination or plans the multi-destination tour. When usual way is inaccessible or when the destination has changed location an alternative pathway is determined dynamically. The algorithm considers elevators, staircases, doors and halls. It shows an General Evacuation Plan to locate the nearest exit, fire extinguishers, medical area, first aid kit, Camilla, etc. 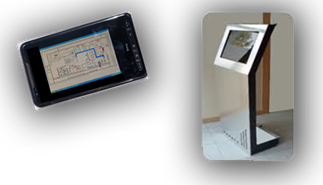 Based on the current position of the user, the system identifies and loads automatically the plan of the Pavilion.. It doesn’t require any data network cabling, neither infrastructure of antennas is being used. It doesn’t work on specific devices and standard hardware used in basic and modular configuration. A simple and lively parameterized interface is offered, where the user can interpret "visually" the way, the total distance and the estimated duration. The support is automatized and therefore reduces interruptions and minimizes staff intervention. The associated cost is diminished. When the usual way is inaccessible or if the target destiny has been moved to other location, the system analyzes the situation and set dynamically a new way. Different access profiles to all public, staff, suppliers and private use, making security assistance are distinguished. Gives immediate evacuation plan information and publish time events through banners or events piles. The user does not need to learn how to operate as the application as it is totally intuitive and its performance is implanted in the client in a short period requiring minimal training to learn all its functionalities.